When you restore sight to a child, you transform the life of the child, as well as that of the entire family! Imagine not being able to see. Then, imagine that a pair of glasses or a simple 15-minute surgery is all it would take to restore your sight and change your life forever. But you cannot pay for either. Now, imagine you are a child who doesn’t learn to read or receive an education because you cannot see. Nikolas is helping children in need receive the gift of sight through his Running the World for Children: Stateside campaign. Money raised goes to the Seva Foundation, a non-profit organization dedicated to the prevention of blindness and preservation of eyesight. 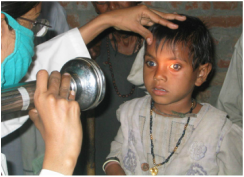 Seva’s eye care programs make a special effort to reach children, the most vulnerable members of our human community. Why this cause? Nikolas’s father is an eye doctor who has volunteered countless times all over the world, providing eye care to people in need. Nikolas has learned about this critical need while growing up. An estimated 500,000 children become blind each year. Most live in developing countries. By providing access to proper eye care, 80% of blindness and low-vision can be prevented or cured. $100 covers the cost of specialized Pediatric Sight-Saving Surgery to restore the sight of a child. Early detection of preventable eye diseases is essential in underserved communities where quality vision care is neither affordable nor accessible.